How do Brand Guidelines work? Brandkit is brand centric Digital Asset Management software. What we mean by brand centric is that here at Brandkit, we are concerned with helping you manage and build a better stronger brand, by helping you consistently reproduce your brand through the management, curation and controlled distribution of your brand assets (the visual representations of your brand). Brand Guidelines are an important aspect of this brand centric approach. They are the formalised rules or playbook for the use of your Assets (images, logos, videos, graphics, etc). Gives you a dedicated Brand Guidelines page in your portal. Handles single or multiple brands and corresponding brand guidelines. Automatically attachment of Brand Guidelines when assets downloaded or sent. Each Brandkit web portal has a dedicated Brand Guidelines page and a spot in the main Nav (although if desired this can be removed). This page can be customised (just talk to your account manager). Clients can also elect to have a standard PDF guidelines page or a custom written interactive HTML version of the Guidelines page. 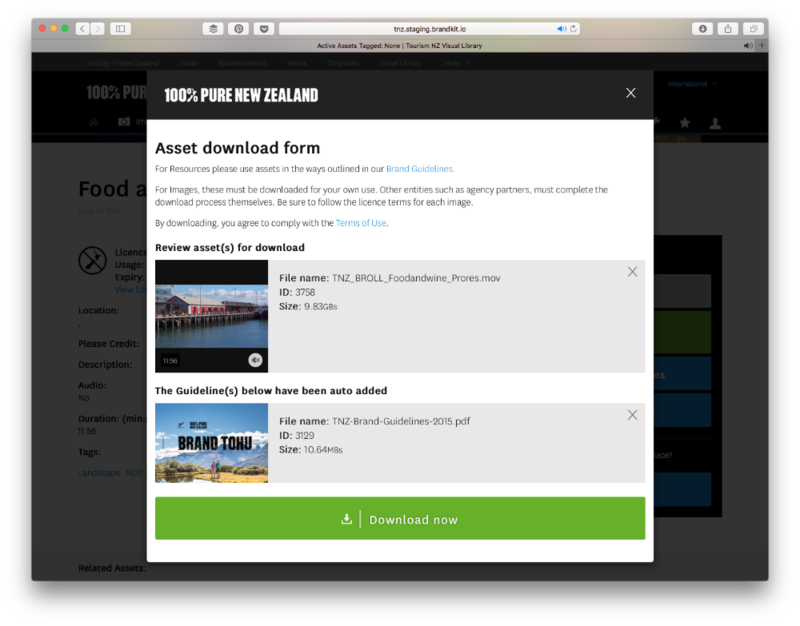 The example above shows a Brand Guidelines page using the standard PDF method for Tourism New Zealand. 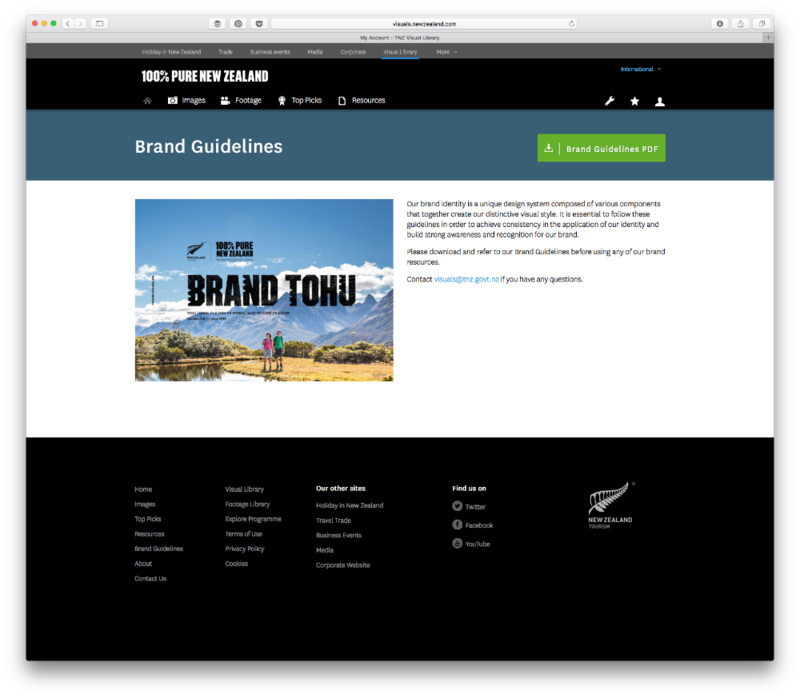 Note Tourism NZ elected to remove the Guidelines nav item (it’s in the footer instead). Admins can then modify what Guidelines are used. Essentially the Brand Guidelines are just another Asset in the library (PDF). 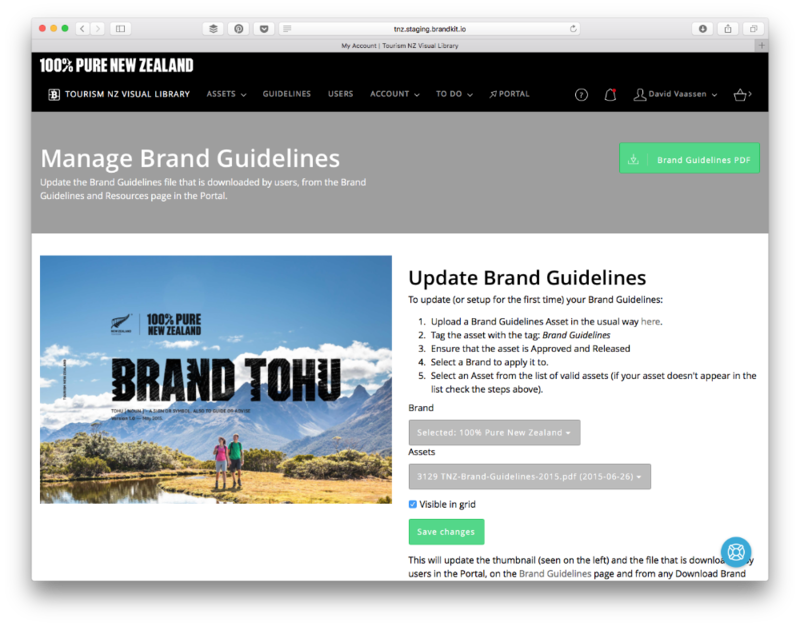 So an Admin will upload a Brand Guidelines PDF and tag it: Brand Guidelines, then in the Manage Guidelines page in Admin, select the Guidelines Asset for each brand. More than one Brand or Brand Guidelines document? No problem you can have as many brands and corresponding brand guidelines as you want. One thing we know is brands and we invented automatic delivery of brand guidelines way back in 1997. Essentially any download of a brand asset will automatically include a PDF copy of the Brand Guidelines applicable to the downloaded asset(s). Select an asset or assets for download in Brandkit. If the asset belongs to a Brand that has Brand Guidelines configured for it, we’ll automatically add the Brand Guidelines asset to the download (as seen above). Simple but handy. We’re opinionated! We say you should download the Brand Guidelines with each download - to ensure brand compliance. But we recognise that sometimes repeated downloads are wasteful and will annoy some. So the user can remove the auto-added Guidelines if they wish to and continue on. Note: It is possible to configure your account to NOT automatically add Brand Guidelines to Downloads and Sends. However you will need to contact us at support@brandkit.io to get this setup. It’s simple and effective. We hope you agree.